Don't get FOMO if you can't make it, find everything you need to see here. ORLANDO, Fla. - Disney's highly-anticipated Toy Story Land officially opens Saturday at Hollywood Studios, meaning it's probably going to be a zoo. The chaos surrounding excited Disney and Pixar film fans alike shouldn't keep you from missing out on the fun, though. If you don't like crowds or long lines, or you simply just can't make it to opening day, don't let that FOMO (fear of missing out) get to you -- we've got you covered. News 6 got to preview the new attraction before it officially opened, and we've got a full breakdown of everything there is to experience in the park. Ride-lovers, you won't want to miss the chance to ride Slinky Dog Dash or Alien Swirling Saucers. Slinky Dog Dash is a two-fold coaster, as News 6 reporter Clay LePard and digital journalist Brianna Volz got the chance to see here. The setting is among the coils of one of Andy's favorite toys, Slinky Dog. But during this playtime sesh, Andy stretched the dog's coils to the max, which means you're in for quite the ride. You whip around turns and dip down quite a few minor drops before slowing down to be launched again. As Ramit Kapoor, the senior manager of marketing strategies at Disney, explains, the double launch makes the coaster a first of it's kind. Kapoor also details some of the other must-see hidden gems throughout the ride and overall attraction. And as for the Swirling Saucers ride, don't underestimate it like the News 6 team did. Sure, the little green aliens look adorable and not intimidating at all, but they're not exactly the best candidates to be in front of your carts. Do they even have their driver's licenses? Probably not, and the series of sharp turns make that pretty clear. The idea of the ride is that the toys, also known as the riders, will come in twos, also known as play sets, and hop on the carts to avoid being grabbed by The Claw. Fans of the first Pixar "Toy Story" film are sure to get the reference. The alien in front of riders' carts will direct them where they need to go in order to escape. As the News 6 team admitted after they first rode it, it's got more swirl than you think. The rides aren't the only fun thing to explore during your visit to Toy Story Land. Let's take a look at the rest of the attraction. For competition-loving guests, get your game on at Toy Story Mania or Midway Games. Even if you're not that competitive, Toy Story Mania gives you the chance to cool off in an air-conditioned building and hang with Mr. Potato Head before you grab your 3-D glasses and board the cart. Once you're on, you'll need your best aim to try for a high score. Winner buys lunch at Woody's Lunch Box! Midway Games is a great way to keep the competitive spirit going -- only the friendly kind, of course. Find some of your favorite carnival-themed games and see how many prizes you can take home. If you weren't so lucky but still want to take home some goodies, you can obviously still stop at one of the merchandise booths throughout Toy Story Land. They've got everything from Sheriff Woody-themed Mickey Mouse ears, Alien Claw cups and character T-shirts, to alien and Slinky Dog headbands. Use the completely interactive map below to find some of the merchandise spots to shop while you're there. The fun doesn't stop there, though. What's a visit to Toy Story Land without interacting with your favorite "Toy Story" characters? 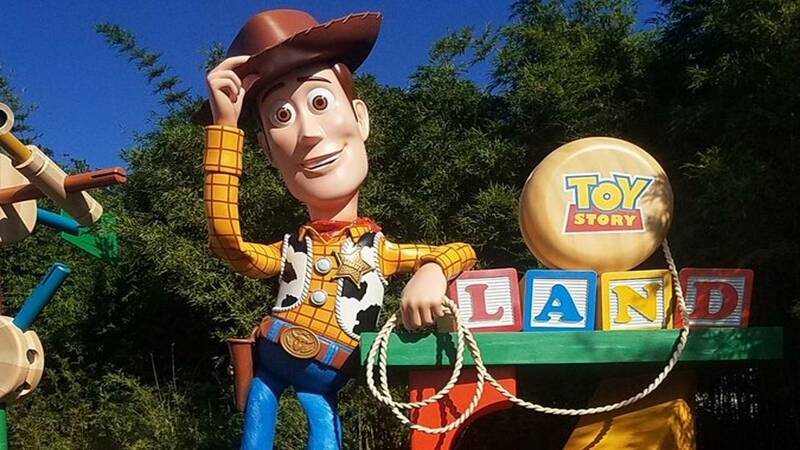 Sheriff Woody greets you on your way in, Jessie stops by to teach you her cowgirl wrangle, Buzz waves as you enter the line to ride the Swirling Saucers and Sarge and your favorite green army men will you stop you in your tracks anywhere in the park to put you to the test. Pro tip for recruits: Practice your ball-catching and jumping-jack abilities ahead of time. To get the full experience, you might want to actually go, but this should have been a pretty close second. The best advice we can give to make the most of your visit would be to pay attention to the little details that bring the theme to life, as Kapoor explained in his interview. Some of those are also highlighted in the interacted map above. Have fun exploring, and remember, as Buzz Lightyear would say, "To infinity and beyond!"